The woman on the veranda is Georgie. 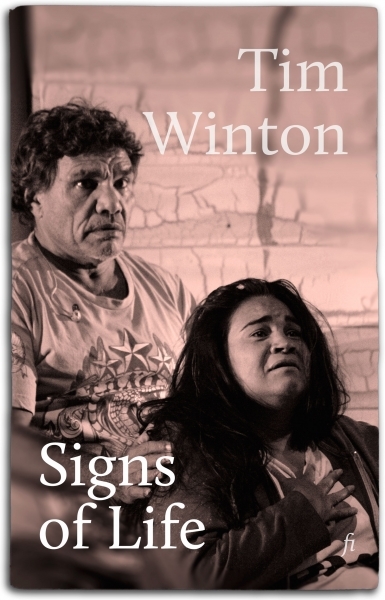 As readers of Tim Winton’s novel Dirt Music already know, Georgie is from a well-off middle-class family and although she has been transplanted to a hard rural life, she retains a sense of security, an understanding of her place in the world, only challenged by a loss that occurs before the beginning of the play. The interlopers are Bender and his sister, Mona. Ironically, Bender has the least sense of place; although he longs to identify with the landscape he is also terrified of its power. He has no traditional language and no real sense of belonging, but he has a profound sense of family—a dedication to his addled sister despite his horror and revulsion at her past. The past has a powerful hold over the characters in the present, as ghosts interweave effortlessly with the present and claim their reckoning. The ghost of Lu embodies the power of the past. At times, memories seem more potent than the present. Georgie, Bender and Mona cannot inhabit the present with any peace or clarity until they revisit and name their past.